Лежит в зале с Леди и Лордом Уэйкрест. Предположительно квест на 2-ую звезду можно получить у тренера, после ~ 100 навыка травничества. Если задание было выполнено до изучения первого ранга, то второго ранга может не быть. Получилось восстановить звезду с помощью книги, которая продаётся у тренера Утерянные кул-тирасские знания. НЕ стоит сбрасывать профессию, т.к. книга вернёт только награды за задания, но всё остальное, в том числе уровни предыдущих и текущего дополнения пропадут. The book is located in the basement room where you fight Lord and Lady Waycrest. It's in an alcove right as you come down the stairs. You CAN jump out of the ditch and grab it after you have defeated Gorak Tul, just use the tree roots creatively. The quest item is inside the Усадьба Уэйкрестов dungeon. Can complete on Normal, Heroic and Myphic 0 difficulty. Book is located in the 4-th boss room Лорд Уэйкрест fight on Catacombs level. It is on the wall opposite from the boss initial location. When you go down the stairs it is to the right. If you already killed the final boss, don't worry, you can still pick up the item, just go back and try to jump on roots in the rift. Seeking More Knowledge quest can be started in Boralus Harbor from Деклан Сенал herbalism trainer. I was able to take it after ~100 level of profession skill. As others have mentioned, you can pick this item up after killing the last boss. However, you do not need to worry about jumping up the tree roots. If you go to the top of the spiral staircase in the last boss's room, there is a portal that will take you back to the previous room. No trick jumping necessary. It's at the 2nd last boss of the dungeon, after you've cleared everything in the cellar and top 2 floors of the manor. I just did this quest today in normal mode dungeon. The book is in the room where you fight Lady Waycrest and her Husband. On a side, as you came down the stairs. I'm uploading 3 screenshots from different angles. It is possible to complete В поисках новых знаний before learning Rank 1 Anchor Weed because there is no condition on the quest. This results in no rank and you will be stuck at rank 1 when you learn it later. Either make sure your learn rank 1 first or contact customer support for a fix. I created an account here just to solve this issue. If you get to the bottom of the catacombs, and you kill the final boss, if you go up the stairs a little bit and through an area which the screen will turn black and sparkly, it will immediately put you back in that room where you had to kind of jump down into a skinny little trough. That’s where you get the book, in that room. I have rank 1 and i can't take the book. I see it, but i can't take it. Very nice to have a profession dungeon quest where you didn't have to go out of your way. Because most random groups don't want to help you do it if it means going out of the way. Just adding this comment as people haven't commented on where the actual book is lately. It's in the room with Lord and Lady Waycrest. On the right just as you enter the room before turning left to face them. I dont mind professons quest sending you on dungeons, but please, next time just dont make it only alliance side (LFG). Horde alts used only to farm plants can't join via LFG tool. Still some weeks into BFA and haven't yet find a group/people willing to join a WM normal run. just for anyone doing this on horde under lvl 120. you can run this on normal but you need to enter it manually. my advice is unlock drustvar as your first stronghold, then make a group in lfg explaining what ur doing. 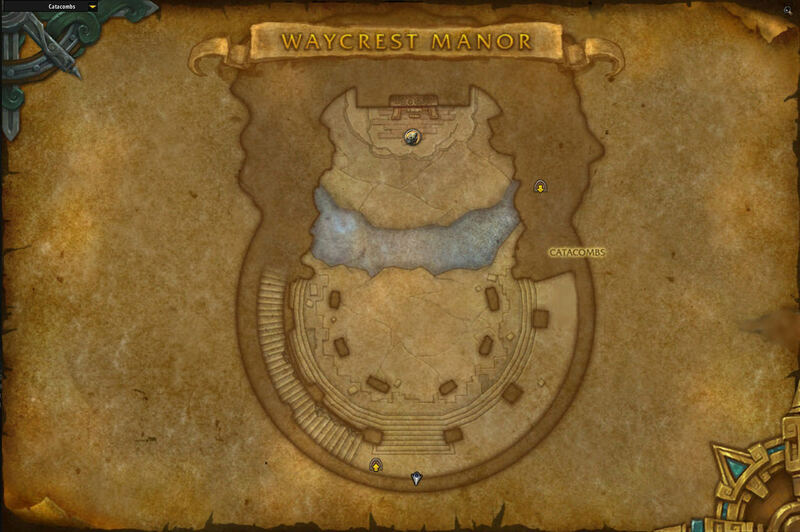 you wont be able to choose waycrest as the dungeon but u can just put in the title "waycrest normal read discrip" then fill the description that u are doing the herb quest, it may take a bit, but you will get other people who are doing the quest as well, and some who just like to flaunt their high ilvl dps. either way you will get it done. you can enter manually at 110. You need to have BFA herbalism skill +100 in order to see this quest at your trainer. I don't think you can complete the quest if you're running a mythic. Just completed Mythic 2 and it won't let me pick up the book and Gorak kill did not count. If you haven't got this quest available from the herbalism trainer, its because you did the quest prior to getting rank 1. You have to buy the book Утерянные кул-тирасские знания from the herbalism trainer Деклан Сенал in Boralus. Learn it and rank 2 should be active. Принесите "Трактат о якорь-траве" из усадьбы Уэйкрестов. Стыдно это признать, но мои знания о растениях не всеобъемлющи. Хотя ты теперь знаешь все, что мне известно о якорь-траве, думаю, ты почерпнешь еще больше из одной книги. К сожалению, она в усадьбе Уэйкрестов, а та местность в последнее время кишит монстрами. Если все-таки попадешь в особняк, ищи книгу под названием "Трактат о якорь-траве". Ее автор изучал этот проклятый сорняк десятилетиями. Превосходно! И в отличном состоянии! Давай посмотрим, найдется ли тут что-нибудь полезное для тебя. Ага! Вот так! Стручки открываются, когда растение чем-то потревожено, но если сначала сделать надрез в основании, можно выпустить воду из клапана, который открывает и закрывает стручки. Так что начинай снизу и постепенно иди наверх, тогда урожай будет лучше.